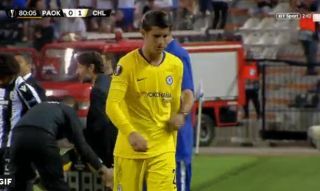 Alvaro Morata did not look happy to be taken off this evening and appeared to blank Chelsea manager Maurizio Sarri as he left the pitch. The Spain international misfired again in this Europa League tie, with a number of efforts that went wayward in the game in Greece. Morata was seen as an exciting signing when he joined Chelsea from Real Madrid last summer, but things really haven’t worked out for him in England so far. Tonight was another bad performance, and it looked as though he was feeling pretty bitter about it as Sarri decided to sub him off.